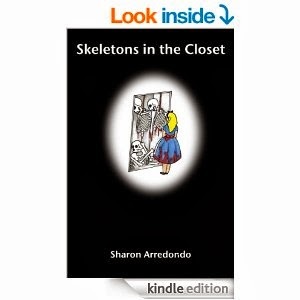 "Skeletons in the Closet," by Sharon Arredondo, is a suspense/thriller (with some aspects of horror) that will have you on the edge of your seat until you finish. The aptly named book is about family secrets in a broken family. The book is written in third-person, and each chapter focuses on a different character. One of the characters is Esther Higgins, a woman married to an alcoholic, gambling man. When her life becomes chaotic, the story flashes back to Esther's youth, when she was involved in a tumultuous relationship that affected her greatly. Esther's daughter, a teenager, has dark secrets of her own and violent tendencies. The character-driven plot gets going quickly and keeps its pace throughout the novel. The characters are very dynamic and complex, and it is interesting to read about how they became who they are, as well as guess what they will do next. The book's writing is solid, and the author does a great job of painting emotions and scenes with descriptive words. If you like suspense/thriller with a touch of darkness, then you will love this book.